TreadWare announces exciting new features for their software. TreadWare CEO, Clayton Van Kleeck recently announced that Treadware is expanding and growing in all directions. “We have assembled our dream team and our clients will reap the rewards”, stated Clayton from his Lake Katrine, NY headquarters. A new dedicated Systems & IT Engineering department was launched in October of 2016 and they have developed a stand-alone turnkey Server/Workstation technology platform that has already been deployed and has met with rave reviews. “This new approach allows us to completely package and build the system for our clients and ship it 100% ready to work on delivery”. SystemAX100 is complete with all the parts required to run and operate TreadWare, and it ships with a one year parts/labor warranty. A strong feature is that the system arrives with remote desktop service and support software included, so that if any problems arise the engineering team can remedy the situation right away. 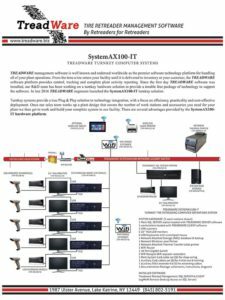 Download our SystemAX100 Flyer which depicts our most frequently ordered 5 work station system. It is so important to understand and experience the technology platform you are purchasing. TreadWare has installed a 24/7 remote desktop training lab. According to Nigel Redman, Director of Engineering services, “The training lab allows a client to actually work on their system before it leaves our facility. They can see how it operates and familiarize their staff with the operations about to be part of their everyday work”. Once a client’s system is ready and tested a logon invitation is generated thus providing 24/7 access to the actual system being made ready for shipping. The TreadWare Software Development team is our latest addition to the TreadWare family. “This department is responsible for improving the current version of TreadWare and working on a continuing program to provide enhancements and client requested features” says Clayton. “We now have a plan in place to provide releases two times per year.” The Software Development team will also handle the direct client interface for remote desktop tech support which includes system remedy and deployment fixes on a regular basis. Joe Valentine, Software team leader states, “There will still be a voice on the phone when you call us, but now our Customer Relations staff will be able to refer any calls to the right team for the proper response”. Clayton Van Kleeck is known for his expertise in the retreading world. 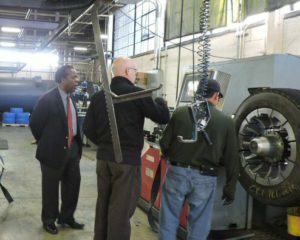 Recently he was requested to host a trade delegation from Central Africa to provide an educational tour of the tire retreading business. Mr. Van Kleeck was happy to spend a day giving them a full tour of the Ranger Tire facility in Long Island NY where owner John Roefs explained the process from his years of hands-on experience. The group returned to Zimbabwe to make a formal report and will extend a consultation agreement to TreadWare to help develop the plant. Clayton was insistent to point out, “TreadWare will provide education, guidance and logistical assistance to the host country, but the project is 100% a Zimbabwe operation from beginning to end”. Zimbabwe business developer Alf Muronda stated, “ The expertise of TreadWare is vital to the success of the project and the TreadWare team will work well with our home team to get the plant built and operational”. Pictured here, Clayton Van Kleeck and Alf Muronda discuss the process of tire inspection at Ranger Tire in Long Island, NY.